Walt and Eileen Brys invite you to sample their international award-winning wines in their beautiful brick and mahogany tasting room. While sipping the wine, enjoy breathtaking views of the East Bay and 80 acres on Old Mission Peninsula reborn. Walter and Eileen Brys planted the first of 40,000 vines in 2001 and opened the doors of their tasting room in 2005. Their 31-acre vineyard is part of the 80 acres that makes up Brys Estate. In the Spring of 2008, Brys Estate expanded their vineyard to 31 acres and planted additional Pinot Noir, Cabernet Franc and Merlot. Today, as an estate winery with 91 acres and over 40,000 vines, Brys Estate remains intimately tied to the land. The wines we produce are the result of our strong-back and earth-crusted hands. We keep our heads down and eyes focused on our work. We lovingly tend our vines, much like our children, knowing what they’re capable of. We tenderly coax them, blending science and sweat equity, to achieve a greater yield and higher quality. Accessible off the existing patio, the new 1,800 square foot “Upper Deck” offers seating for 48 guests. Elevated six feet, the deck allows guests to see above the vines and take in the spectacular views of the vineyard and East Grand Traverse Bay. The deck is also home to a tasting room, where guests can purchase wine by the glass and charcuterie and cheese boards while taking in the view. Unique to any tasting room in Michigan, take a stroll on the “Bridge Above the Vines” which extends out into the vineyard allowing guests to walk above the vines to an observation area perfect for photos. Gaze out over 35+ acres of grapes as they roll down toward the East Grand Travere Bay. Drink in the view as you walk above 5 rows of Chardonnay vines. Here are the latest photos of Brys Estate Vineyard and Winery via Instagram. Tag your Brys Estate instagram photos with #brysestate and they will appear here in our Brys Estate Vineyard and Winery Instagram Photo Stream. 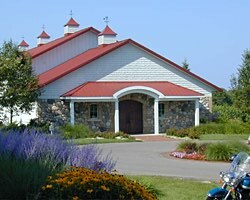 The Michigan Wine Blog - Wineries and Vineyards of Michigan - produced by North Guide Internet.